This is a great scanner which is very quick and reliable. I already have three of these between home and office computers and am just about to buy a fourth. No more filing cabinets! Fujitsu ScanSnap S1500M that I purchased from Tradescanners is excellent. Rapidly deals with large stacks of documents. Feeder is excellent at taking one sheet at a time. Software package is also comprehensive and easy to use. 5 out of 5. I researched, in some detail, where to buy my Scansnap, and reviews of Tradescanners were really good. I wasn't going to buy the Fujitsu ScanSnap S1500M originally, I was going for the S1300, but your price was so good that the decision was a no brainer. The reviews of your business were spot on. The delivery was quick, the whole service experience was great. Normally I don't buy warranties, but I felt that I had to. Not due to worries but I always support my favourite suppliers and you are definitely on that list. Without a doubt the Fujitsu S1500M Scanner is the best thing since sliced bread. A fabulous FAST easy to use machine. I can't recommend it highly enough!!! I'm using the scanner to archive years' worth of old magazines which are taking up too much space. I experimented with the settings for quality vs file size which is very easy to do and having found the happy medium I'm now well under way with the project. Scanner has performed faultlessly and I'm very happy with the results, particularly like the duplex scan which makes life so much easier than our old flatbed scanner. The bundled Adobe software is the icing on the cake. Rating: 5 out of 5. One of the most usefull peripherals I've ever decided to buy, it is transforming the way I file and share documents. I work from home and use for both work & home filing. It's compact, fast and I've encouraged friends to buy. I'm Still experimenting with settings and getting to know the adobe software bundled with it. The only tweak I'd like to see is an option to save many more profiles. The Fujitsu ScanSnap S1500M is absolutely fabulous: Ease, Speed, Versatility, Size, Aesthetics. 5 out of 5. Excellent service, competitive price and brisk delivery. What more can I add? Built on a tradition of reliability and innovation that has made Fujitsu a market leader in personal and professional document scanners, the ScanSnap S1500M breaks new ground in delivering even higher performance and easier operation for Mac users in the home or at the office. There's speed and then there's speed with quality. The ScanSnap S1500M has been engineered to deliver even faster performance with up to 20 pages per minute in color, grayscale, or black & white; however, S1500M remains just as fast when scanning at a higher resolution of 200 and even 300 dpi color or grayscale. ScanSnap S1500M has several automatic features to help ensure scans look their best without operator intervention before or after they scan. 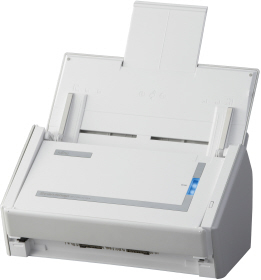 Auto Quality: ScanSnap S1500M can now be set to detect small documents intermixed in a stack placed into the automatic document feeder and automatically increase their resolution to help ensure that the finer-print typically associated with smaller documents (such as receipts and business cards that are shorter than A6) are made more discernable. ScanSnap S1500M is now equipped with an ultrasonic multi-feed detection sensor that can be turned on to help operators avoid losing images. What’s more, an interactive interface allows users to easily and quickly bypass intentional double-feeds such as a taped-receipt on an expense report. Users can move beyond merely "seeing" and "printing” PDF documents to searching and editing them however they like and Adobe® Acrobat® 8 Professional supports password protection and digital ID creation, ideal for safeguarding personal and confidential information on PDF files. Mac users can now achieve even greater productivity by converting paperwork into editable text by scanning directly into Microsoft® Word and Excel at the touch of a button.